Last year I went out and bought a big catfish rod along with all the hooks, leaders, etc so that I could real in one of those monsters. To my surprise I didn't catch a single one all season long. What would you guys say is the best bait/way to catch the big ones? I don't eat them so I don't care about the quality of the fish. I just want to catch and release some monsters. Also, I live close to the Mon but mainly fish the Allegheny because I target walleye. Any tips you have would be greatly appreciated. live large shad, bluegill, trout, perch, etc. with the fins clipped so they have to thrash but can't really get away. i fish the yough and those bait's do well for me. i also keep one rod out there with a dough bait made from cheese, ground cat treats with shredded cotton smashed in to help hold the bait on my hook. i find that the closer the fish are to 10lbs the less likely they are to hit the dough bait. Bluegill under a big bobber or a soda bottle drifting. if your feeshen the mon. below the locks with the biggest live bait that u can chuck out there. bluegill or creekchubs are the norm. then kick back and just wait. go at dark and fish all nite. Why don't you use some tasty trout cut up. I caught three huge ones last week on it. 27",26",and 25"
I don't fish the Mon, but some things are universal for cats... they tend to hang out in the deeper holes during the heat of the day and come up onto flats/shallows after sun eases off in evening. Find a nice hole with shallows nearby and it would be a good start, add some cover in the form of dead trees/debri then it is even better. If they find decent cover they will stay in it all day even in shallow water and come out in the evening to hunt nearby flats. If you aren't out on a boat you can about expect that top outside of river bends scour holes and insides of them get sediment buildup causing shallows. Larger cats and ones feeding more aggressively seem to be more likely to hit live bait (though there are always exceptions to the rule), next would be larger, chunky cut bait of something that smells or is oily, gobs of nightcrawlers is a staple bait for midsized channels and bullheads. Wow, Fisherlady might really be Catwoman! I hear that Tull! Thanks for the info fisherlady. I think I'm really going to give it a go this summer. I have to admit, I do enjoy fishing for the ugly brutes... and actually, some I don't think are really even that ugly.... though ya gotta admit, a flathead just isn't a pretty picture! We have spent many overnights on the river just kicked back and relaxed and happy to catch a few. Certainly worth the research TastyTrout, don't expect trophies on a regular basis but even the smaller ones are a blast to catch. Have fun and good luck! On the internet, EVERYONE is entitled to their opinion! that's a nice fish....did she weigh it? It was 41" long, took a 7 or 8" bluegill in 21ft of water at very top edge of a deeper yet hole, September, and weighed at 32 lbs. If you are targeting only BIG cats, I would suggest big, live bait. Bluegill, chubs, and/or whatever 5-12 inch fish swim in the water you are fishing. Cut bait will sometimes catch a big one, but live is probably better, imo. 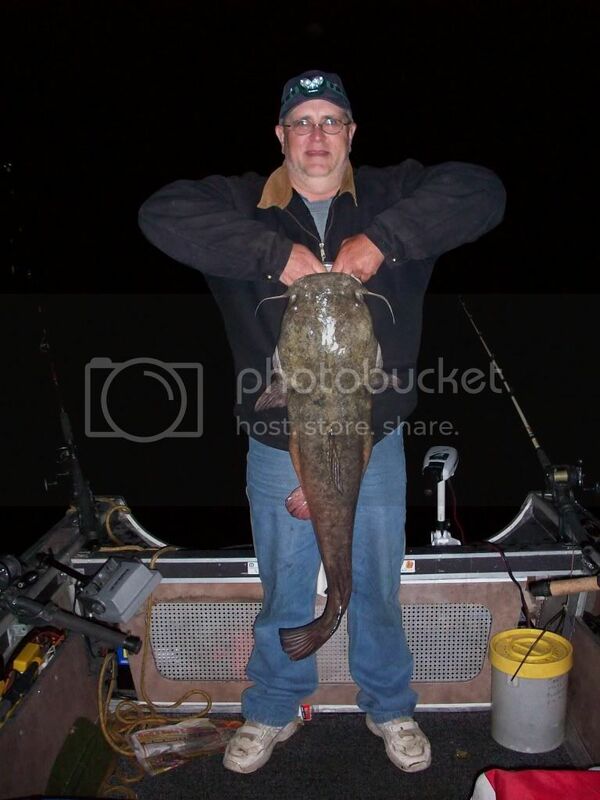 I like to use cut bait and shrimp, but them again I only catch channel cats here in Erie, nice fish! LMAO!!! thats no 32# or 41" looks like a cookie cutter 10-13 lbs. if your not use to seeing flats a 15lber looks like a 30lber. when you catch a 30 lb+ flat you will know it, trust me. if i know how to post pics here i would show you a #32.
your "game fish" is my bait.....got flathead!! I'm sorry if I upset any of the reputable members on this board, but for my own sake, I need to call moose22dog on this one. Here is the full pic from that nite. The weight was taken with a Rapala digital scale, and length was with a Stanley pocket tape measure. In the pic you see a yellow and white bait bucket - it measures 12" from top to bottom with the lid on. - compare it to the fish. Also, I an 6'5" tall - compare me to the fish. If you want to measure the bucket for yourself for comparison, that CAN be arranged! Gather your information before calling another member a liar. Moose, dead bait better than live for flatheads? I have always used live bait, but then again, I never caught a real big flat. Thanks for the tip, i'll be trying that for sure. You used a 17" smallie for catfish bait? In the Ohio river fish deepest holes,big live bait gills as big as you can get them,crappies 9-10 inches and even small carp ,40 plus inch flatheads. Another sleeper spot is walnut creek after a summer storm,when it gets high and muddy ,I've caught some HUGE channels at night on cut bait or a gob of crawlers. Any live fish 6"-8" works great. My preference is Warmoth and Bluegills. 8/0 circle hooks with baits hooked on the top of the back just in front of the tail. Use enough weight to hold bottom on a fish finder rig. Don't set the hook. Let the rod load and once the fish is pulling drag, start reeling. Big cats are most active at night. I've only been fishing for big cats for two years so I'm by no means an expert. I do have three fish over 30 lbs using the above method. Not legal to use live carp as bait. now thats a 30+ lber nice fish, but please don't hold them by there gills. thats like me picking you up by your ears, you be bleeding as well. and i think your talking about green sunfish not warmouth's ( they are endangered) and yes greenies are one of the toughest/best live bait around. congrats on the fish again. thats still no 32#! the mouth and head is way to small! just saying! "but please don't hold them by there gills." Didnt want to sound like a know it all, or trying to reprimand anyone, but I agree that is VERY GOOD advice. Ive seen lots of pics of guys holdin' flats like that and possibly the fish no worse for wear. But its easy to slip the fingers into the gills and they are EASILY damaged. There is a perfect handle on a flathead, and thats the mouth. The blood coming from the gills in the pic shows that its much safer for the fish to hold by the mouth. The fish will not hurt ya, it aint a musky. A fish that size is a very old fish, and a very good breeder, and not a "common" fish in Pa systems. A true "trophy". Please be careful with them!